Water is the typical heat storage medium in a liquid-based solar collector system and pebble beds frequently provide thermal storage for air-based systems. 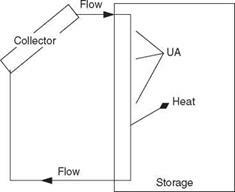 The typical liquid storage design is for fluid flow on one side (the collector) and no flow on the other (the storage). In Fig. 11-12 is sketched a liquid system heat exchanger. 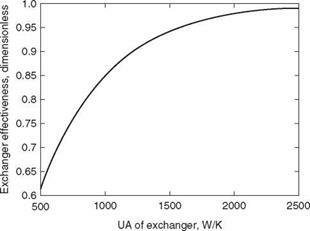 The UA value is the overall thermal conductance of the exchanger (A is the exchange area; U is the average unit area thermal conductance). A typical exchanger surface would be made of a coiled copper pipe, perhaps with fins to provide sufficient area of exchange. Manufacturer specifications generally include a UA value, usually as a function of transport-fluid flow rate. Water from the collector enters the storage warm or hot, and cools as it passes through the exchanger. In the ideal situation, the circulating fluid leaves the storage at the storage temperature—all the possible heat has been removed. In practice, this is impossible without an indefinitely large heat transfer area or residence time. Figure 11-12 Sketch of heat exchanger, liquid system. For a heat exchanger with flow on only one side, calculate the effectiveness based on the following equation. Equations are available to determine effectiveness values for other types of heat exchangers and may be found in many heat transfer books. Example 11-1 Graph the heat exchanger effectiveness with transport Liquid flow on one side (such as shown in Fig. 11-12). The mass flow rate through the exchanger is 0.15 kg s-1 and the transport fluid heat capacity is 3500 J kg-1K-1. Explore the UA range from 500 to 2500 W K-1. The script file creates the graph shown in Fig. 11-13. As a perspective, a mass flow rate of 0.15 kg/s would be typical of that required for a 10 m2 solar collector array, and a fluid heat capacitance of 3500 W K-1 represents a solution of ethylene glycol and water.